A scene from “The Trump Card” at the La Jolla Playhouse. 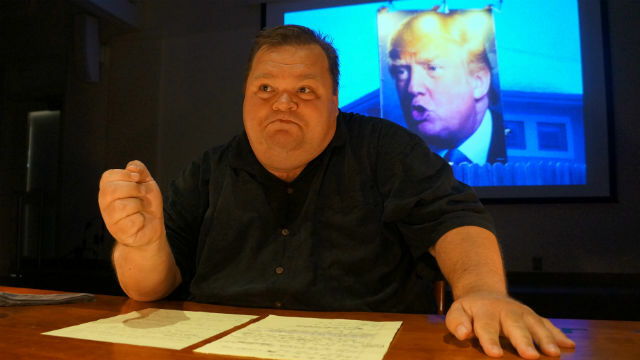 Mike Daisey is not a happy camper. He rants, he rages, he curses (a lot). But the acclaimed monologist doesn’t just lament the sorry state of the Presidential campaign. He’s hellbent on connecting all the historical dots that got us to this terrifying place. He can be as funny as he is angry. But he implicates all of us, for how far “The Orange Pied Piper” has gotten. He also traces the “Pompous Pumpkin’s” origins and mentors: starting with the documented racism of The Donald’s father, Fred Trump, who was also famous for not paying the workers who literally built his empire. Then there’s Donald’s 13-year lawyer, friend and consigliere, Roy Cohn. The infamous architect of the 1950s Red Scare, Joseph McCarthy’s right-hand man, Cohn (especially as represented in Tony Kushner’s “Angels in America”) was a gay homophobe and an anti-Semitic Jew. He was also a monster (Daisey says Kushner’s brutal portrait actually went easy on the real man). According to Daisey, Cohn taught Trump everything he knew. It all sounds very serious and nasty — and it is — but there are many laughs along the way. And, true to his word, Daisey does not give us the catharsis promised in theater since the time of the ancient Greeks. He leaves us disturbed, unnerved, anxious and keyed-up (possibly more than when we walked in). We all may be part of this current madness (he criticizes liberals for “smugness”), and we may be living with it for a long time to come, whether Trump becomes President or not. “He’s already won,” says Daisey, sending shivers down our collective spine. As a writer/actor/monologist, in the vein of the late, great, navel-gazing Spalding Gray, Daisey sits center-stage at a table, with a few pages of notes (which he neatly – compulsively?—aligns numerous times), a glass of water, and a small towel to mop his (profuse) sweat. He’s an excellent writer and performer who, like the man he’s skewering, knows exactly how to massage and manipulate an audience’s emotions…and how to fire us up. He deeply understands pace and timing, crescendos and pauses. We’re watching a master at work (under the direction of Isaac Butler). We get glimpses of Daisey’s own past: his conservative parents, and his unfortunate issues with peanut M&Ms. But mostly, it’s the political landscape he’s painting, and it isn’t a pretty picture. One of the most praiseworthy parts of Daisey’s piece is that he’s making the script available to anyone, anywhere, at no charge whatsoever. It can be edited and performed at will, freely downloaded from his eponymous website (mikedaisey.com). That’s how strongly he feels about the dissemination of this information. Actors and theaters, take note. If you’re more the audience type, scuttle over to the La Jolla Playhouse and see the man himself, delivering his incendiary words (only through 10/9). You may be alarmed or dismayed — but you won’t be sorry. Performances are Thursday-Saturday at 8 p.m., Saturday and Sunday at 2 p.m.